05 Oct Nutrition, Nutritional Facts, Product Specifications, Prunes (Dried Plums) No comments. Three cans of Stapleton’s Prunes have the same number of servings as six cans of just about any other fruit, and at roughly $0.27 per serving, you can’t go wrong. 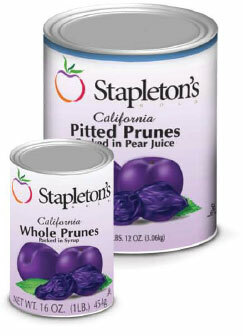 Stapleton’s canned pitted prunes or whole prunes: moist pack or packed in either juice, syrup or water. Canned prunes have a shelf life of up to 24 months when stored in a cool dry environment, double the shelf life of a bagged product. Eco-friendly cans cost less to recycle than bags. As a topping on cereals and yogurt. Add to muffins, breads, cakes and sauces. 5770 ORAC units per 100 g./3.5 oz. Ask for Stapleton’s easy-to-store and manage 3 – #10 can case size. More servings than 6 cans of other fruits!